I’m not talking about comedians here, I mean graphic novels and comic strips, but not necessarily superheroes of the ‘kapow!’ and ‘kersplat!’ variety. With many popular films and tv shows being turned into comic book series, and vice versa, there are more characters and illustrated adventures than ever before. Creations like Sin City, Scott Pilgrim and all the Marvel characters you can name have been made into successful movies and on the flip side books, and then films, like Twilight have their own comics. While it is great to see some amazing visions brought to life on the big screen it can be detrimental to the cult of comic books, the investment a fan makes is suddenly sold and turned into a franchise – it is just as irritating when the usually elitist (or geeky) world of comics gets invaded by popular fiction, like Twilight and its sparkly vampires. So here, in no particular order, is my list of some of the best, original, gothic comic books around. 1. The Crow. The ultimate goth comic as ultra-romantic couple, guitarist Eric Draven and platinum blonde Shelly, are killed the night before their marriage in a vicious attack by a criminal drug addicted gang. The film is quite close to the J. O’Barr comic but nothing could match the intense, dark artwork inspired by the authors personal tradegy – his own fiance was killed by a drunk driver. Eric returns from the dead to avenge their deaths and then joins his lost love in the afterlife. A gothic tale of love and revenge. In black pvc and face paint. 2. The Sandman. Probably Neil Gaimans’ most popular work this award winning comic intended to revive the 1970’s DC character ‘Dream’ but DC insisted on a new character – Gaiman was allowed to retain the original name though. Dream is one of The Endless who embody the powerful driving forces of the Universe – Destiny, Death, Dream, Destruction, Despair, Desire and Delirium. 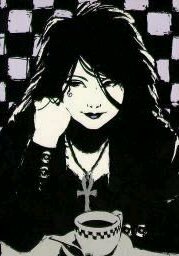 Death is especially popular with the gothic-minded as she is a skinny goth chick and is also suprisingly cheery (apparently). She was voted fifteenth best comic book character by Empire Magazine. The Sandman series has been descirbed as ‘a comic book for intellectuals’ and won awards no graphic novel had before. 4. Hellblazer. Staying with the demon hunter theme the series featuring John Constantine is my number four. While it was made into a successful film in 2005 the main character was played by notorious plank Keanu Reeves and Constantine went from platinum blonde and British to raven haired and American. – they still kept the chain smoking in though so it wasn’t all bad. Constantine is an anti-hero with questionable moral values, who likes swearing, smoking and magic. Sounds like a lot of people I know. 5. Lenore. She had to be in here somewhere – not all gothic tales involve demons, vampires and zombies, some involve little blonde dead girls who like to kill small animals. Written by Roman Dirge, Lenore is named after a character from one of Edgar Allan Poes’ poems and she lives in the town of Nevermore so her goth credentials are there from the start. She keeps ‘accidentally’ killing Mr.Gosh, who is in love with her, as well as any kittys that come her way. Actually she ends up killing, maiming or squishing most things but all in the cutest scary-girl way. 6. Gloomcookie. While on the cuter side of dark comics here’s one of the first I ever bought. Gloomcookie, the first series anyway, is beautifully illustrated and tells the tale of gorgeous Lex and her trials and heartbreaks within the goth scene. It simultaneously celebrates and ridicules elements of our subculture and you are guaranteed to spot characatures of people you know within the story. I lost interest after the first collected works when the artist changed but nonetheless a great little romantic and twisted fairytale read. 7. Johnny the Homicidal Maniac. The title says it all. An odd and gothic-ly styled boy called Johnny goes around killing things (animals, dolls, people) while ranting to himself about life and his desire to kill others and sometimes himself. I only read the first comic last month and have now bought every issue, it is that funny. He also rants at ‘normal’ people and about fake goths. Favourite quote from the first issue “Today I nailed dolls to the wall that I had filled with rats I put in the blender. Perhaps there is something wrong with me…” Who says Goths don’t have a sense of humour? 8. Nemi. Sarcastic, single and Norwegian, she kept me entertained when I lived in Manchester and caught the Metro every day – she had a regular strip in the free paper, but was originally published in our mummy magazine Terrorizer. She discusses failed dates, hangovers and irritating men with dry wit and exhausted sarcasm. Brilliant. 9. Gotham by Gaslight. Again, what more do you need to know that isn’t in the title? This one off, critically acclaimed comic sees Batman fight a Jack the Ripper character in Gotham City. A brilliant, gothic, steampunk-esque dark knight adventure, that became part of the ‘Elseworld’s’ collection that puts Batman in alternate relaties. 10. Arkham Asylum: A Serious House on Serious Earth. A more psychological and fantastical Batman novel featuring The Joker holding the whole of Arkham Asylum hostage in order to meet with Batman and put him through a series of trials in which he fights other criminals in the asylum. With an intriguing back story about the hospital and amazingly creepy illustrations this is one of my favourite Batman stories. Ever. Ones that didn’t make my list but – Black Widow, The Adventures of Luther Arkwright and The Walking Dead were suggested by Dominion blogger Pete and Preacher, Deathnote and American Vampire from my friend Carly over st SyFy are also worth checking out! RIP Chuck Schuldiner. Ten years gone, always remembered.